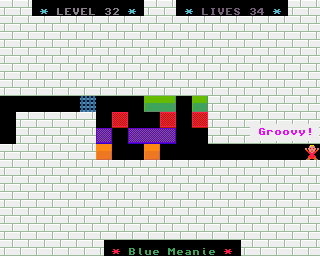 Level thirty-two is small puzzle about going up to down. It is named Blue Meanie. Push RIGHT, RIGHT, go DOWN and push LEFT. Go DOWN, push RIGHT, go UP and push RIGHT. Go LEFT, DOWN and push RIGHT. Go DOWN, push LEFT, go RIGHT, go UP and push LEFT. Go DOWN, push LEFT, go RIGHT, UP and push LEFT. Go DOWN, RIGHT, push RIGHT, RIGHT and RIGHT. Go UP, UP, UP, push LEFT, LEFT and LEFT. Go DOWN, push LEFT, go RIGHT, UP, push RIGHT, RIGHT, go DOWN and push RIGHT. Go DOWN, DOWN, LEFT, push LEFT, LEFT, LEFT, go UP, push RIGHT, go UP and push LEFT. Go RIGHT, DOWN and push LEFT. Go DOWN, RIGHT, push RIGHT, RIGHT and RIGHT. Go UP, RIGHT, UP, UP and push LEFT. Go RIGHT, DOWN, DOWN, LEFT, DOWN, LEFT, push LEFT, LEFT, LEFT, go UP, UP, RIGHT and push RIGHT. Go UP, push RIGHT, RIGHT, go DOWN, DOWN, RIGHT, DOWN and RIGHT. Congratulations. You have completed MazezaM thirty-two. You are now going to MazezaM thirty-three.